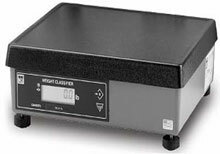 The Salter-Brecknell 7815/7815R is a digital electronic parcel bench scale specifically designed for shipping applications and is legal for trade. The NCI Model 7815R has a standard RS-232 serial interface that enables it to be easily connected to a computer or other data processing device. The Brecknell 9503-17293 is also known as Brecknell Scales	9503-17293	or 950317293	.